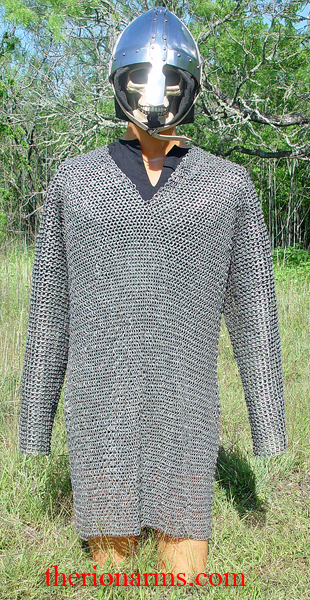 Maille, or mail, or "chain mail" (as popular culture and web search engines call it) was the #1 armor from Roman times up through the 14th century, and was still used on the battlefields of eastern Europe and central Asia well into the 20th century. 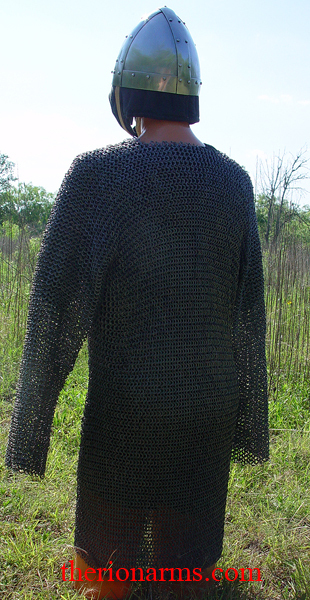 This knee length full-sleeve hauberk is crafted of alternating rows of 9mm dome-riveted flat rings and punched solid rings. 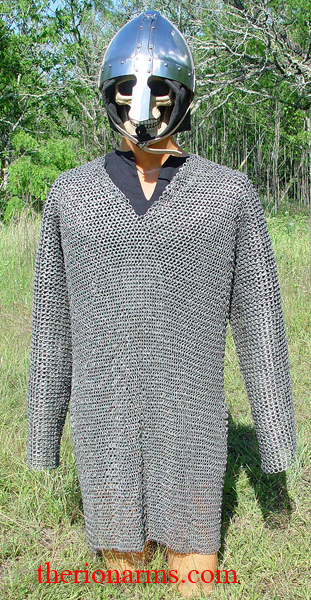 The alternating rings makes this a very strong, combat-worthy maille. Available in sizes 48" and 60". These sizes relate to the actual circumference of the mail garment rather than to chest size. 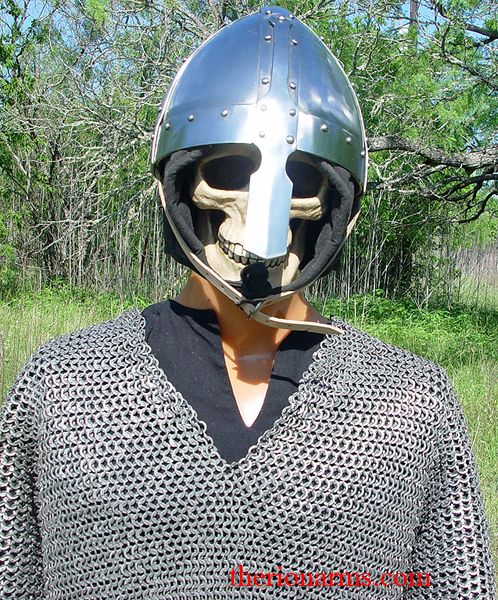 The 48" is about 39" from shoulder to hem and will fit up to about a 44" chest dimension measured over a gambeson an/or arming clothes, and the 60" size is about 42" from shoulder to hem and will fit up to a 54" chest dimension, again measured over the gambeson and/arming clothes. 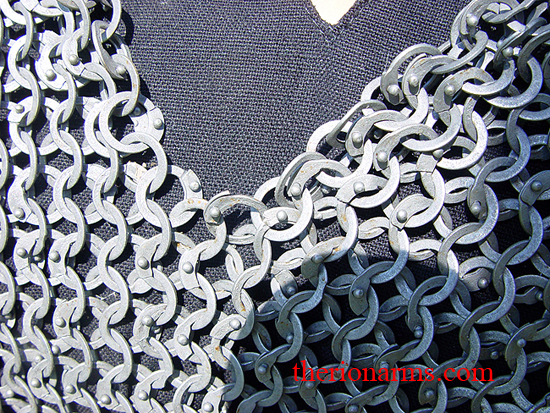 The rings of this mild steel maille have been heat-treated to a medium gray color and the entire piece has been heavily oiled to prevent rust. This helps with corrosion issues but it is recommended that maille with this finish be thoroughly coated with a silicon or rust-preventative spray when not in use and stored in a ventilated plastic tub in a warm, dry location. 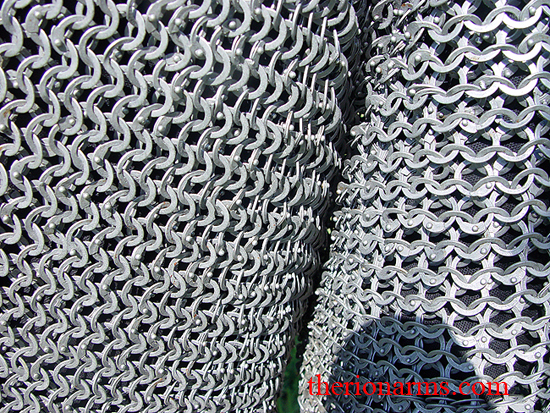 TherionArms also offers a professional cleaning and sealing service for these hauburgeons and hauberks - each piece will be de-oiled, de-rusted, and treated to prevent corrosion. The treatment isn't perfect (no treatment for mild steel is), but it's a big improvement.